It was a day of prayers and protests yesterday over the endless killings of innocent Nigerians in some parts of the country by rampaging herdsmen. Christian Association of Nigeria (CAN) President, Supo Ayokunle, called for the protests as a wake-up call to the Federal Government that the bloodletting must stop. However, there were no protests in the Southeast. The protests in Lagos, Ibadan, Ado-Ekiti, Akure, Kaduna, Port Harcourt, Makurdi, among others, were largely restricted to the Baptist Church. Rev Ayokunle is of the Nigerian Baptist Convention. According to The Nation, Pentecostal churches, which are mostly affiliated to the Pentocostal Fellowship of Nigeria (PFN), did not join the protest. In Kano, the state chapter of CAN chose prayers instead of a protest. It declared that the killings were the handiwork of mercenaries and urged the Federal Government to treat the killers as terrorists. He said: "The alleged herdsmen killers are mercenaries. We demand the Federal Government to declare and treat them as terrorists. The association praised Governor Umar Ganduje and the Emir of Kano, Muhammad Sanusi II, for the peace among residents. Rev. Adeyemo said CAN in Kano decided not to protest the killings so as not to give hoodlums the opportunity to hijack it, adding that through prayers, “God in His infinite mercy will intervene and restore peace in those trouble areas”. “We demand the need to go the extra mile to free the Chibok girls, Leah Sharibu and all those abducted by the terrorists irrespective of tribe and religion,” he said. Christian leaders in Kano gathered at Believers Baptist Church, 6, Zungeru Road where they prayed to God to save Nigerians from killers. Rev. Ayokunle led the protest in Ibadan where church members converged on the Oritamefa Baptist Church in the Oyo State capital. The protest was restricted to the church premises. Youth groups and women estimated to be about 2,000, walked round the church premises and vicinity. They called on the government to stem the killings. The service in the church was also to offer thanksgiving for the success of the just- concluded Annual Baptist Convention, which held in Port Harcourt, the Rivers State capital. 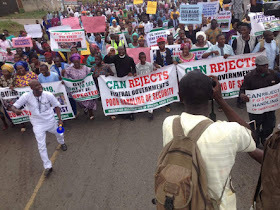 Inscriptions on some of the placards read, “CAN says No to Violent Killings”; “FG, stop this wicked act”; “CAN says No to Religious Killings”; “FG, release Leah Sharibu from Captivity”; “Enough of Bloodshed in Nigeria, CAN rejects FGN poor handling of insecurity”; “Human beings are more valuable than cattle, protect human beings”; “FG be sensitive to families that are mourning”; “No more excuses for mass murder”; and “Enough of unlawful killings in the country”, among others. There was also a protest at the Gospel Faith Mission International International (GOFAMINT) Church, Akanran Road in the Ona Ara Local Government Area. The protesters sang and condemned the killings. In Lagos, protests were held at the Shepherded Hill Baptist Church, Obanikoro where congregants protested at the Obanikoro Bus Stop, chanting “no more bloodshed”. They carried placards, with inscriptions such as, “CAN rejects poor handling of insecurity”, “Arrest and prosecute wicked killers in Nigeria”, “Federal Government of Nigeria, take full responsibility for security in Nigeria”, “Enough of bloodshed in Nigeria” and “Federal Government ensure immediate release of Leah Sharibu from captivity”. Senior Pastor Israel Kristilere said the protest was to make Nigerians realise that the church was no longer find the killings palatable. He said the government must stand up and ensure security of Nigerians. “Government must be responsive and responsible. It is their responsibility to ensure the security of lives and properties and whatever it takes to do this can never be too much. If there is need for more gadgets, they should get it,” Kristilere said. He noted that many of those troubling the country were no ghosts, adding that if the government spends billions of dollars to tackle insecurity, it is not too much. “We are also demanding the release of Leah Sharibu from the custody of Boko Haram,” he said. Kristilere urged the government to be serious with insecurity. He prayed for the exposure of all those sponsoring bloodshed, adding that God will destroy all the plans of the wicked ones. In Ekiti, the protesters took to the streets from about 2.00 pm. Policemen and Nigeria Security and Civil Defence Corps (NSCDC) members watching over them. This was aside the protest in the early hours by various individual churches, such as Gospel Faith Mission International (GOFAMINT) and the Baptist Church among others. Led by the CAN Chairman Rev. Joshua Orikogbe, the protesting Christians marched from the CAN House at Ori Apata on Adebayo Road in Ado-Ekiti to the Adekunle Fajuyi Memorial Park. They ended the protest at the Government House where they sent a letter to President Buhari through Governor Ayo Fayose. The CAN chairman said: “We are for peace in Nigeria but it is like we are being pushed to the wall by these wanton killings of Christians and clerics. “To us in Ekiti CAN, the only way to sustain peace is for the government of the day at the federal level to abandon politics for sometime and focus the needed attention on security and safety of lives,” he said. Fayose, whose Special Adviser on Religious Matters, Pastor Seyi Olusola, received the protesters, praised them for being peaceful. The Ekiti State Baptist Conference President Rev. Yinka Aribasoye has called on the Federal Government to stop the killings. He called for the resignation of the Service Chiefs if they could not guarantee the security of ordinary Nigerians. The presiding pastor of the First Baptist Church, Okeyinmi, Ado-Ekiti, Reverend Kayode Ayinde, enjoined Christians to pray for Shaibu’s safe return. Christian faithful in Makurdi, the Benue State capital, wore black and white dresses as a mark of mourning for the murdered Catholic priests and parishioners of St Ignatius Church, Mbalom, Gwer East Local Government Area. Two Catholic priests Rev. Father Joseph Gor and Rev. Father Felix Tyolaha, as well as 16 worshippers were killed at mass on April 24. A correspondent of NAN, who went round some churches in Makurdi, reports that most worshippers, regardless of denomination, wore black and white dresses. NAN also reports that the worshippers held peaceful protests within their churches to denounce “the acts of barbarism” on innocent citizens. They held placards with inscriptions such as “Enough of the killings”, “We want peace in our state”, “No more bloodshed”, “Lord, what have we done to deserve this?’’ among others. At the NKST church in Iyortyer, Makurdi, the worshippers carried placards, marching peacefully within the premises. Ikyaan said that the dress code was reminiscent of the tradition of the church in wearing sack clothes when faced with such calamities. The cleric said that the killing of the priests had further deepened their faith, adding that no amount of intimidation would stop them from practicing their faith. Security operatives were patrolling the state capital while the church services were ongoing. Members of the First Baptist Church in Rivers State staged a peaceful protest within the church’s headquarters. A church leader, who declined to be named, said: “It is unfortunate that President Muhammadu Buhari has not said much since the advent of the herdsmen killing of Christians in Southern Kaduna, parts of the Northeast and recently Benue State. "We are demanding the immediate release of Leah. They want to turn this into a religious war. If the Federal Government does not act now and end this madness, Christians will rise up and defend themselves and Nigeria will be worse than Afghanistan, Mali and Rwanda,” he said.